Wrexham beat Welling to move within touching distance of the National League play-offs. 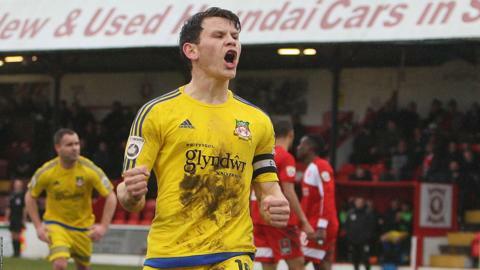 Lee Fowler's close-range finish and a penalty from Connor Jennings gave Wrexham a commanding 2-0 half-time advantage. Kayden Jackson hit the post as Wrexham continued to press after the break but were unable to add to their lead. Wrexham are now sixth in the table and only behind Gateshead, in the final play-off spot, by two points. Manager Gary Mills told BBC Radio Wales: "We've played well today and in the second half I thought we were outsanding. "It was an excellent performance. It's never easy coming here, we know that, and I think it's the first time I've won here actually and it feels good." Match ends, Welling United 0, Wrexham 2. Second Half ends, Welling United 0, Wrexham 2. Substitution, Welling United. Nortei Nortey replaces Harry Lee because of an injury. James Ferry (Welling United) is shown the yellow card for a bad foul. Lee Fowler (Wrexham) wins a free kick. Attempt blocked. Tomi Adeloye (Welling United) right footed shot from outside the box is blocked. Attempt missed. James Ferry (Welling United) left footed shot from the centre of the box is too high. Attempt saved. Luke Wanadio (Welling United) right footed shot from the right side of the box is saved. Attempt saved. Kayden Jackson (Wrexham) right footed shot from the centre of the box is saved. Marek Rodak (Welling United) wins a free kick. Attempt saved. Blaine Hudson (Wrexham) right footed shot from the centre of the box is saved. Assisted by Connor Jennings. Attempt blocked. Sean Newton (Wrexham) left footed shot from outside the box is blocked. Attempt saved. Sean Newton (Wrexham) left footed shot from the centre of the box is saved. Assisted by Connor Jennings. Attempt blocked. Kayden Jackson (Wrexham) right footed shot from the right side of the box is blocked. Kayden Jackson (Wrexham) hits the woodwork with a left footed shot from the centre of the box. Attempt missed. Lee Fowler (Wrexham) right footed shot from outside the box misses to the left. Ade Yusuff (Welling United) wins a free kick. Attempt blocked. Noah Chesmain (Welling United) left footed shot from outside the box is blocked. Substitution, Welling United. Tomi Adeloye replaces Kadell Daniel. Attempt missed. Ian Gayle (Welling United) header from the centre of the box misses to the right. Assisted by Luke Wanadio.